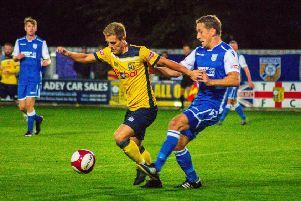 Tadcaster Albion manager Simon Collins blamed a “poor” second half for Saturday’s costly 3-0 defeat to Brighouse Town. The Brewers went into the interval having shaded proceedings during the opening 45, only to concede three times after the resumption as they slipped out of the Evo-Stik East play-off picture. "First half we had some good chances, but second half I didn't think we were effective getting in and around their back-four and I thought there was a bit of a lack of supply for the forwards," Collins reflected. "It was just all-round poor second half because of a combination of things. "We didn't react quick enough, we didn't go with runners and missed a couple of tackles at vital points. When we were in possession we weren't composed. I'm massively disappointed. "Excuses aside, I think Brighouse were the better side and fully deserved the 3-0. They're very good at what they do, the league position doesn't lie and that's why they're up there." There were no goals during a scrappy first period that saw six players booked, though Casey Stewart did manage to beat home stopper Jordan Porter, only to see the his effort disallowed due to a dubious offside decision. The deadlock was eventually broken after 53 minutes, but it was a Brighouse player who struck. Tom Haigh cut in from the left and got the better of returning Albion captain Michael Ingham with a firm left-footed shot. Gabriel Johnson and Haigh then combined to set up leading scorer Aaron Martin, who rifled in title-chasing Town's second via the under side of the cross-bar on 75 minutes. Iwan Heeley wrapped things up soon afterwards, thundering home the hosts' third of the afternoon from 12 yards out. The result sees the Brewers drop down to sixth position, leaving them two points outside the Evo-Stik East play-off places ahead of Tuesday's home clash with Sheffield FC (7.45pm).